The annual March for Life rally in Washington D.C. is always an adventure for youth. This year, that adventure went one step further with the bus load of students from the Omaha Diocese getting stranded in “snow-mageddon”. This bus includes the twenty-three Pope John XXIII Central Catholic students and four adult sponsors from the Elgin area. On Friday, the students joined counterparts of all faiths from across the country in the March for Life held in DC. Immediately after the march ended, they boarded theirs buses to head home, hopping to beat the anticipated heavy snowfall. They became stranded between Philadelphia and Pittsburgh on the interstate. According to adult sponsor (on the bus) Steve Kerkman, “we heard there are jack-knifed semis and buried cars ahead (on the interstate). I’m seeing some cars coming back on our side, they may be the ones that were stuck.” Early today, Kerkman sent this photo and said, “We’ve been sitting still for thirteen hours. Everyone is upbeat. We are warm, safe and have plenty of snacks. As of noon today (Saturday) they are still sitting but believe they we be able to begin moving soon. 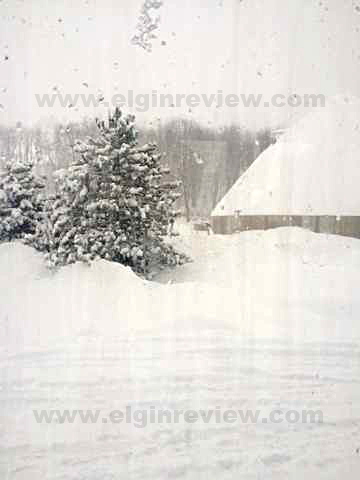 The Elgin Review will continue to update you on a regular basis via twitter (@theelginreview) and facebook (Elgin Review).